Occupying adjacent spaces on Queen Street, Husk’s structures date back to the late 1800s. The main dining room, constructed in 1893, evokes the grandeur of Charleston, and speaks to the transformation of the city over time. Victorian details and turned columns were layered over the original Queen Anne-style façade through the years, and the buildings fell into disrepair until discovered by Husk ownership. The Neighborhood Dining Group President David Howard set into a motion an extensive remodeling effort of both. 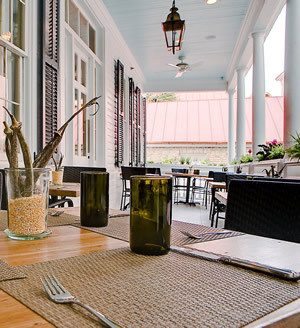 The building retains its antique charm and stately exterior while the interior has been renovated with a modern, minimalist theme, designed by Michael Shewan of Michael David & Associates of Charleston, SC. Although both buildings retain their antique charm and stately character, the renovations imbued each with a modern, minimalist theme. Like the reinterpreted food served within, each space has been laid bare, revealing reclaimed floors, original windows, and exposed brick throughout. The main house features an open kitchen with a wood-burning oven and dining room. Both floors are fronted on Queen Street by sweeping piazzas, or porches, and the courtyard allows diners to enjoy themselves in the late afternoon. Next door, the adjoining structure houses the bar, a rusticated, exposed-brick affair, with a cozy, two-story outlay. Once reduced to a shell, the bar now comes to life in the evening, when patrons relax in front of the large upstairs windows. Both spaces feature abundant natural lighting and accurate trim details that make them true to their historic roots but remain modern in disposition.